Led by Dr. Francois Lalonde, our orthopaedic team provides consultations and treatment for hip problems of any complexity, including developmental hip dislocation, Legg-Calve-Perthes disease, slipped capital femoral epiphysis, impingement, trauma, infection, overuse and hip conditions in children with cerebral palsy and spina bifida. Our pediatric-trained orthopaedic surgeons offer expertise in adolescent conditions requiring hip reconstructive and joint preservation surgery to prevent premature osteoarthritis. Newborns are at risk for hip dysplasia or dislocation, particularly if a baby is born breech or has a family history of the condition. We recommend early screenings to identify dysplasia as soon as possible and begin treatment. We offer a comprehensive newborn screening, including a physical exam and ultrasound by three months of age and hip X-rays by six months of age. Pediatricians who see a baby with hip laxity, clicking, tight hip adductors/abductors or asymmetrical thigh folds may also refer into our program for further screening and treatment. 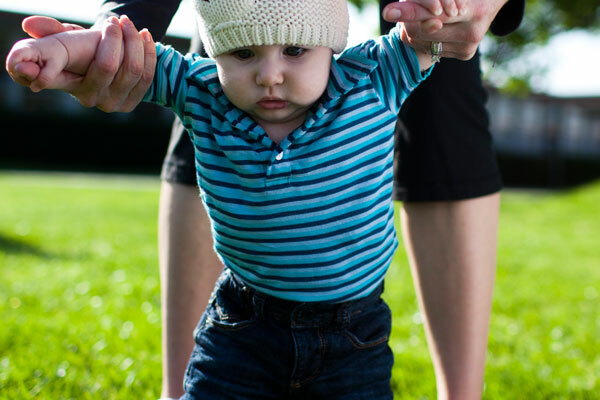 Learn more about our treatment for developmental dysplasia of the hip. To make an appointment with a hip specialist at the CHOC Children’s Orthopaedic Institute, please call (888) 770-2462 and press 2 for specialty care clinics. Childhood can be a wonderful time, but it can also be a dangerous period when children can get hurt from the normal activities associated with playing and just growing up. In this feature, Dr. Carl Weinert, a CHOC orthopaedic surgeon, talks about some of the common orthopaedic conditions and injuries that affect children and why it’s sometimes necessary to see an orthopaedic specialist. Learn more in this health feature at choc.org/health. Casting and bracing are non-surgical options that can treat a number of hip conditions. We will recommend the most proven and successful types, including the Pavlik harness, cruiser brace, John Roberts brace, spica cast and Petrie casts. Our specialists will work closely with your family to place a cast or brace carefully, and child life specialists may be on hand to help your child with calming and distraction techniques. Learn more about our child life services. Children are naturally active. Following orthopaedic surgery, our therapists’ main goal is getting kids back to doing what they love. Our Rehabilitation Services Department provides orthopaedic physical therapy that is designed to meet each patient’s specific needs, increase their mobility and cope with their injury or surgery. Learn more about rehabilitation at CHOC. Hip conditions that go untreated can lead to arthritis and other issues in adulthood. Our surgeons strive to intervene early and specialize in the most innovative methods to preserve the hip joint and its function. Our joint-preserving surgeries include the Ganz periacetabular osteotomy, triple pelvic osteotomy, surgical hip dislocation and retinacular flap, modified Dunn open reduction, pelvic and proximal femoral osteotomies including the Southwick procedure, hip open reduction with capsulorrhaphy, and the SUPER-hip procedure.